The picture below is of F/O Jones and crew. "Ford belonged to F/Lt who took over "T" and went missing. Hope they made it. The Austin Salon APJ 446 provided cook's tour." 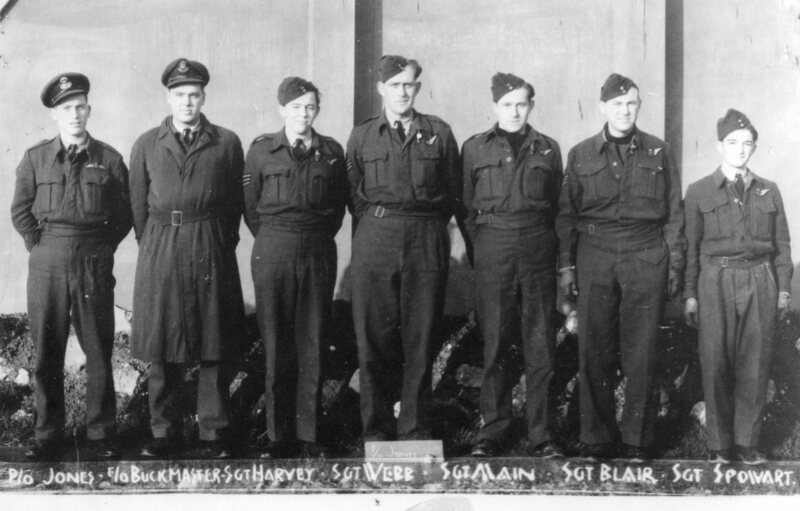 Including PA995 / BQ-V "The Vulture Strikes"
Three of the crew (F/O Jones, F/O Buckmaster, W/O2 Harvey, all RCAF) were killed, while the remaining four became PoWs (although Sgt Smith did later escape and was able to return to his unit in North Killingholme). Station Narrative No. 18, dated 13th April 1945. 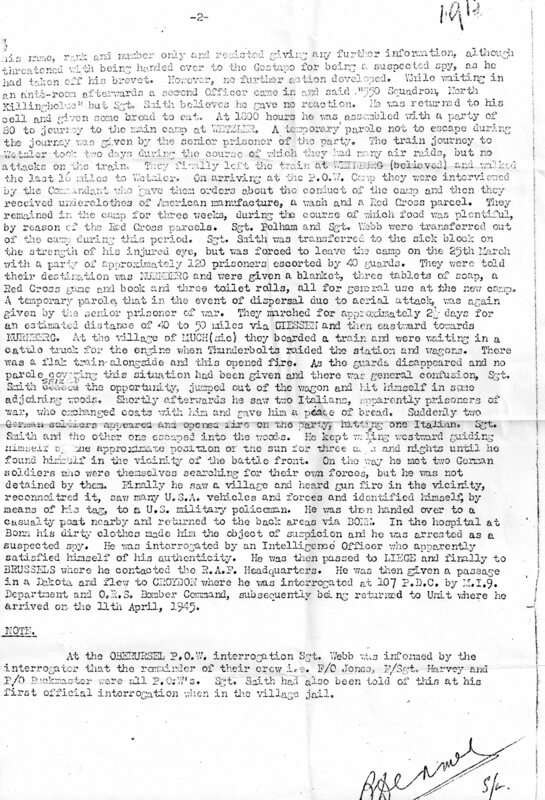 This is a report by S/Ldr Brian Dermer Senior Intelligence Officer (SIO) of the debrief of Sgt Smith at North Killingholme in which is recorded a note stating that at the Oberursel PoW interrogation centre Sgt Webb was informed by the interrogator that the remainder of the crew (i.e. F/O Jones, F/Sgt Harvey and P/O Buckmaster) were all PoWs. Thus the report states in the header that all three of the RCAF servicemen listed as KIA above were in fact "POW per Sgt Smith". The Canadian Veterans web-site lists the three men as KIA and two are commemorated on the walls at Runnymede while the third is buried in Nederweert War Cemetery in the Netherlands (links to photographs of the Runnymede panels and the Nederweert gravestone are available from the 550 Squadron Roll of Honour link above). The evidence is that the three Canadians survived the crash. It is therefore likely that they were thereafter murdered. Thanks to Neil Pelham, son of Sgt. Pelham, for making available information from his father's records. 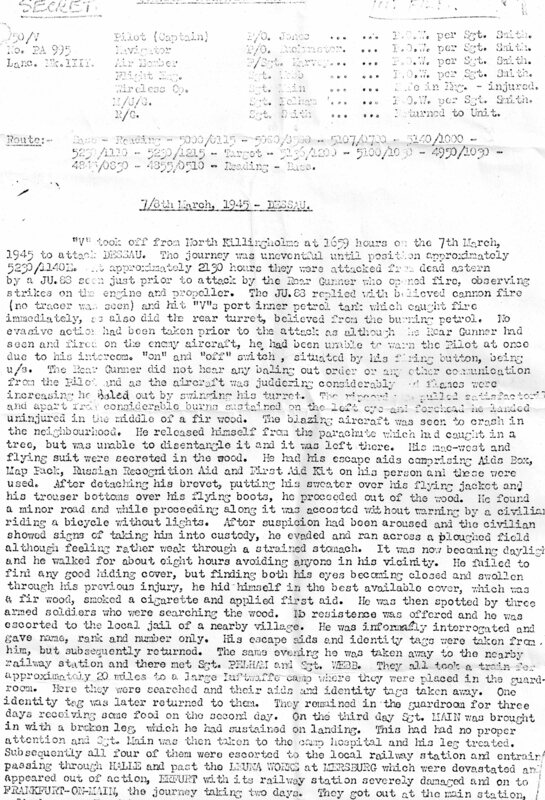 There follows below a selection of pages from the POW and De-briefing reports from the Canadian archives concerning the F/O Jones crew - source: LAC/Ottawa, RG 24 File being gratefully acknowledged. In October/November 2012 a documentary for Canadian TV was completed which featured, among others, a former football player with Toronto RCAF Hurricanes who served in the 550 Squadron. Seven players from the 1942 Grey Cup winning Toronto RCAF Hurricanes lost their lives in WWII, including P/O J Buckmaster (Nav) in the F/O Jones crew. The Photograph: A one hour documentary on a Grey Cup winning football team decimated by World War II. For TSN, produced by Infiedfly Productions.